WIDTH ( OUTRIGGERS RETRACTED ) 4' 1 1/2"
WIDTH ( OUTRIGGERS EXTENDED ) 7' 9 1/2"
FUEL - DIESEL - CAPACITY 30 GAL. FLOOD LIGHT ASSEMBLY - THE FLOOD LIGHT ASSEMBLY CONSISTS OF FOUR 1000 WATT LAMP FIXTURES SEALED FOR ALL WEATHER USE. 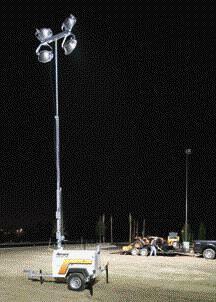 FOR NEW LIGHT BULBS CALL: LIHGTING INC "SEE VENDORS"
* Please call us with any questions about our light tower portable rentals in Tulsa OK and neighboring communities in Northeastern Oklahoma.